The Iranamadu is fed by Kanagarayan Aru that originates from ChemaduKulam in Vavuniya and running 60 km through Mankulam in Mullaitivu. Its catchment area of 588 sq km . The construction of the original reservoir with a capacity of 49 million Cubic Meter commenced in 1902 and was completed in 1920.Hereafter, it was augmented three times and finally, holding capacity was 131 Million Cubic Meter(MCM) in 1975. In addition to the IFAD funding for the Canal rehabilitation, augmentation of the of Iranamadu reservoir under the ADB funding was undertaken.The storage capacity of the tank has been increased by 17 MCM ( now capacity is 148 MCM) and 3 numbers of additional radial gates were constructed in addition to 11 gates with electrification (Now, total 14). At present Full Supply Depth ( FSD) of the tank is 36’00” while High Flood Level (HFL) of the tank is 41’00” and Bund Top Level (BTL) is 47’00”. The recent augmentation project was implemented through a Project Management Unit headed by Director of Irrigation, NP. There was a Consultant firm appointed for design and supervision of the Project while Contractors deployed through National Competitive Bidding Procedure to implement this project. 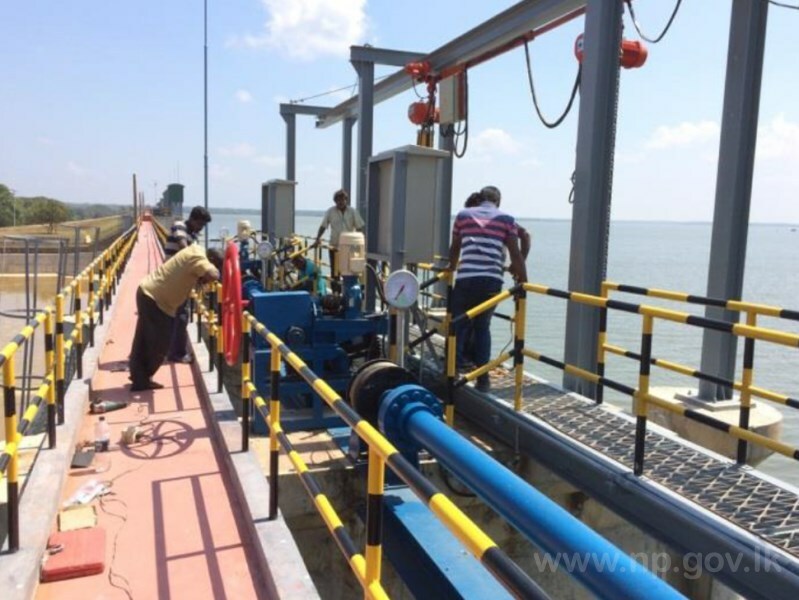 After completion of the project, scheme handed over to the Irrigation Department, Kilinochchi for the Operation during ongoing NE monsoon rain period in early November 2018, though there is a Defects Notification Period of one year was enforced in the Contract Agreement and lasted in June 2019. During this period defects shall be identified by the Consultant, Employer and it can be rectified in time according to the severity of the defects. Further, Based on the instruction of Hon Governor during his recent visit to the scheme, there was meeting with Consultant, Contractor and Employer on 13.01.2019 and it was agreed to complete all defects on or before 31.01.2019 by the Contractor. Accordingly, Contractors have already completed the rectification on arresting the leakages through all gates within the allowable limits. Also, remedial measures for the defects in the electrical control system have already been attended. There are few places where water leakage through the concrete portion and minor repair in gates. Once the water level reduces below the sill level of radial gates, all the defects will be attended. Once all attended, action will be taken to take over by the Irrigation Department NP properly. The regular operation and monitoring is being carried out by Irrigation Engineer’s Office (Kilinochchi) under the supervision of Deputy Director of Irrigation (Kilinochchi Range).For this task, three technical officers and four maintenance labourers will be deployed . However, due to the insufficient maintenance labourers slope protection/clearing works is planned to be carried out through external labour source through a special recurrent allocation.